In 1982, Brosnan moved to Southern California and rose to popularity in the United States playing the title role in the NBC romantic detective series Remington Steele. The Washington Post noted that same year that Brosnan "could make it as a young James Bond." After Remington Steele ended in 1987, Brosnan went on to appear in several films, including The Fourth Protocol (1987), a Cold War thriller in which he starred alongside Michael Caine, The Deceivers and James Clavell's Noble House both in (1988), and The Lawnmower Man (1992). In 1992, he shot a pilot for NBC called Running Wilde, playing a reporter for Auto World magazine. Jennifer Love Hewitt played his daughter. The pilot never aired, however. In 1993 he played a supporting role in the comedy film Mrs. Doubtfire. He also appeared in several television films, including Victim of Love (1991), Death Train (1993) and Night Watch (1995), a spy thriller set in Hong Kong. In 2003, Brosnan was rewarded the Irish Film and Television Academy Lifetime Achievement Award for his contribution to Irish Film. Brosnan married twice, was widowed once and has five children and three grandchildren. Brosnan met Australian actress Cassandra Harris through her stepson David Harris, one of Richard Harris's nephews, in 1977, shortly after he left drama school. On meeting her, he has described his feelings, saying, "What a beautiful looking woman. I never for an instant thought she was someone I'd spend 17 years of my life with. I didn't think of wooing her, or attempting to woo her; I just wanted to enjoy her beauty and who she was." They began dating, and eventually bought a house in Wimbledon. They married on 27 December 1980 and had one son together, Sean, who was born on 13 September 1983. They lived with her children, Charlotte (1971–2013) and Chris, and after their father Dermot Harris died in 1986, he adopted them and they took the surname Brosnan. ↑ "Pierce Brosnan Receives American Citizenship on September 23, 2004". Getty Images. Retrieved 2018-02-20. ↑ Barnes, Mike (2016-01-11). "Beau St. Clair, Pierce Brosnan's Producing Partner, Dies at 63". The Hollywood Reporter. Retrieved 2016-02-04. ↑ "Pierce Brosnan honoured by Navan Town". RTÉ News. 11 November 1999. 1 2 3 4 5 6 7 8 9 10 Chutkow, Paul (December 1997). "Brosnan. Pierce Brosnan". Cigaraficionado.com. Archived from the original on 29 August 2008. Retrieved 23 October 2008. ↑ Farndale, Nigel (29 January 2008). "Pierce Brosnan: James who?". The Daily Telegraph. Retrieved 11 September 2010. 1 2 3 Grant, Meg (July 2008). "Pierce Brosnan Interview: Not the James Bond You Remember". Reader's Digest. Archived from the original on 10 September 2010. Retrieved 19 September 2010. 1 2 "Pierce Brosnan". Inside the Actors Studio. Season 9. Episode 903. 24 November 2002. Bravo. Archived from the original on 9 August 2007. ↑ Byron Allen (host) (1993). "Pierce Brosnan: Part 2". Entertainers with Byron Allen. ↑ "Brosnan is a true Father Figure". ShowBiz Ireland. 1 November 2002. Retrieved 22 February 2007. ↑ Nathan, Ian (October 1997). "The Empire 100 Interview". Empire (100): 116. 1 2 Butler, Karen (February 2007). "Fierce Brosnan". Irish Echo Online. Archived from the original on 5 February 2007. Retrieved 22 February 2007. ↑ Jonathan Jones (30 September 2011). Saint Martins emerges blinking in bright new home. But is it art? : King's Cross premises a far cry from Soho 'hell', but some students fear college will have lost its charm Archived 4 March 2016 at the Wayback Machine. The Guardian. Accessed August 2013. ↑ "Alumni". St Martins College. Archived from the original on 29 June 2011. Retrieved 1 July 2011. ↑ "Drama Centre London: Former". Central Saint Martins College of Art and Design. Archived from the original on 4 February 2007. Retrieved 22 February 2007. ↑ Carrick, Peter (2002). Pierce Brosnan. Citadel Press, p18–36. ISBN 0-8065-2396-4. ↑ Membery, York (2002). Pierce Brosnan: The Biography. Virgin Books. ISBN 1-85227-967-2. ↑ "Manions of America". MTV Movies. Retrieved 16 April 2008. ↑ "Awards for Pierce Brosnan". Internet Movie Database. Retrieved 22 February 2007. 1 2 3 4 5 Last, Kimberly (1996). "Pierce Brosnan's Long and Winding Road To Bond". 007 Magazine. Archived from the original on 9 October 2006. Retrieved 22 February 2007. ↑ Charlie Rose (host) (5 August 1999). "Pierce Brosnan/Rene Russo". The Charlie Rose Show. PBS. ↑ Belson, Eve (July 1993). "Pierce Brosnan: Urbane Leading Man". Orange Coast. 1 2 Broeske, Pat H. (1988-02-21). "'Noble House' Hype: NBC's Heavy Artillery". Los Angeles Times. ↑ Broccoli, Albert R; Zec, Donald (1998). When the Snow Melts: The Autobiography of Cubby Broccoli. London: Boxtree. pp. 280–281. ISBN 978-0-7522-1162-6. ↑ Chapman, James (2000). Licence to Thrill: A Cultural History of the James Bond Films. New York City: Columbia University Press. p. 247. ISBN 978-0-231-12048-7. ↑ "GoldenEye". Box Office Mojo. Retrieved 15 November 2006. ↑ "1995 Worldwide Grosses". Box Office Mojo. Retrieved 24 November 2006. ↑ "Box Office History for James Bond Movies". The Numbers. Nash Information Service. Retrieved 18 October 2007. ↑ "GoldenEye (1995)". rottentomatoes.com. Retrieved 16 November 2006. ↑ "GoldenEye". metacritic.com. Retrieved 24 November 2006. ↑ Roger Ebert (17 November 1995). "GoldenEye". Chicago Sun-Times. Retrieved 16 November 2006. ↑ James Berardinelli (1995). "GoldenEye". reelviews.net. Retrieved 16 November 2006. ↑ McNary, Dave (2016-01-11). "Beau St. Clair, Pierce Brosnan's Producing Partner, Dies". Variety. Retrieved 2016-02-06. ↑ "Bio Basics". 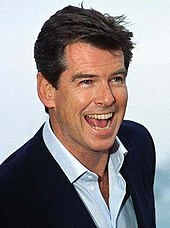 The official Pierce Brosnan site. PBFC. Archived from the original on 4 April 2008. Retrieved 15 April 2008. 1 2 Nathon, Ian (December 2002). "Numero Uno (Die Another Day cover story)". Empire (162): 103. ↑ "Brosnan uncertain over more Bond". BBC NEWS. 2 April 2004. Retrieved 1 May 2011. ↑ "Brosnan: No More 007". scifi.com. 14 October 2004. Archived from the original on 4 November 2004. Retrieved 22 February 2007. 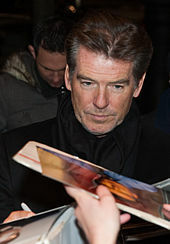 ↑ Brosnan, Pierce (February 2005). "The Official Pierce Brosnan site". Archived from the original on 1 September 2006. Retrieved 13 September 2006. ↑ "Daniel Craig takes on 007 mantle". BBC NEWS. 14 October 2005. Retrieved 22 February 2007. ↑ "Pierce Brosnan answers". Globe and Mail. Canada. 14 September 2006. Archived from the original on 9 July 2008. Retrieved 14 September 2006. ↑ John Anderson (22 January 2007). "A grittier Brosnan takes on riskier roles". International Herald Tribune. ↑ Field, Matthew; Chowdhury, Ajay (2015). Some Kind of Hero: The Remarkable Story of the James Bond Films. The History Press. ↑ "Everything or Nothing". EA Games. Archived from the original on 27 December 2007. Retrieved 22 February 2007. ↑ Thorpe, Vanessa (26 November 2006). "Race to put the passion of Dylan's Caitlin on big screen". The Observer. London. Retrieved 22 February 2007. ↑ Murphy, Garreth (10 May 2004). "Laws of Attraction". entertainment.ie. Archived from the original on 27 September 2007. Retrieved 22 February 2007. ↑ "After the Sunset". Rotten Tomatoes. Retrieved 22 February 2007. ↑ "The Matador". Rotten Tomatoes. Retrieved 22 February 2007. ↑ Ebert, Roger (6 January 2006). "The Matador (2005)". Chicago Sun-Times. Retrieved 22 February 2007. ↑ "'Brokeback Mountain' leads Golden Globe nominations". CNN. 15 December 2005. Retrieved 22 February 2007. ↑ Crust, Kevin (26 January 2007). "Seraphim Falls". Los Angeles Times. Archived from the original on 5 February 2007. Retrieved 19 February 2007. ↑ Rechtshaffen, Michael (18 September 2006). "Seraphim Falls". The Hollywood Reporter. Archived from the original on 19 January 2007. Retrieved 19 February 2007. ↑ "Pierce Brosnan Plans All-Irish Western". StarPulse News. 17 March 2007. Archived from the original on 20 March 2007. Retrieved 19 March 2007. ↑ "Pierce Brosnan to Romance Meryl Streep in Mamma Mia! Movie". Theatre.com. 7 March 2007. Archived from the original on 5 February 2008. Retrieved 5 January 2008. ↑ Kit, Borys (7 March 2007). "Brosnan joining Streep in "Mamma Mia!"". Reuters. Retrieved 8 March 2007. ↑ "Brosnan set for Abba show movie". BBC News. 7 March 2007. Retrieved 8 March 2007. ↑ "Welcome to Paradise! | PARADE Magazine". Parade.com. 15 June 2008. Retrieved 25 October 2008. ↑ "A true romantic". Dfi.dk. 10 May 2012. Retrieved 26 August 2014. ↑ "Dublin University honours actor Pierce Brosnan". Irish Sun. Archived from the original on 17 October 2013. Retrieved 2 March 2013. 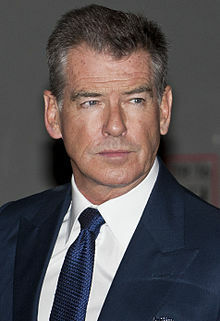 ↑ "Cannes 2012: Pierce Brosnan Joins Crime Scene's Thriller 'The Coup'". The Hollywood Reporter. 1 May 2012. ↑ "Pierce Brosnan to lead "Last Man Out"". ComingSoon.net. 7 February 2013. Retrieved 23 September 2013. ↑ "Pierce Brosnan helps launch €10m Sky campaign". Irish Independent. 9 April 2013. Retrieved 2 May 2013. ↑ Guider, Elizabeth (13 December 2005). "Duo plant a Wildflower". Variety. Retrieved 19 February 2007. ↑ Chitwood, Adam (15 May 2012). "Pierce Brosnan and Dominic Cooper to Star in Spy Thriller NOVEMBER MAN". Collider. Retrieved 17 January 2017. ↑ Abraham, Anthony (19 June 2013). "Shooting begins on thriller November Man". Screen Daily. Retrieved 17 January 2017. ↑ "The November Man Reviews". Metacritic. Retrieved 17 January 2017. ↑ "The November Man (2014)". Rotten Tomatoes. Retrieved 17 January 2017. ↑ "Millennium Sets Milla Jovovich, Emma Thompson, Pierce Brosnan, Angela Bassett For 'Survivor' Thriller Pic". Deadline. 7 October 2013. Retrieved 9 October 2013. ↑ "Pierce Brosnan Stars In Voltage Thriller "I.T."". Deadline. 3 October 2013. Retrieved 4 October 2013. ↑ Hipes, Patrick (27 July 2016). "Pierce Brosnan's 'I.T.' Acquired By RLJ Entertainment For September Bow". Deadline Hollywood. Retrieved 17 January 2017. ↑ "Pierce Brosnan To Star In AMC Series 'The Son' In TV Return, Replaces Sam Neill". Deadline Hollywood. 6 June 2016. Retrieved 8 June 2016. ↑ "Simon Kaijser's Thriller 'Spinning Man'". Deadline Hollywood. 25 April 2017. Retrieved 1 May 2017. ↑ "Behind the Scenes of Mamma Mia! Here We Go Again". E!. 21 October 2017. Retrieved 7 December 2017. ↑ "Pierce Brosnan joins Dave Bautista in 'Final Score'". Deadline Hollywood. 26 July 2016. Retrieved 30 July 2016. ↑ "'Goldeneye' Star and Director to Reteam For Ernest Hemingway War Movie". Movies.com. 8 February 2016. Retrieved 8 February 2016. ↑ "Exclusive interview: Martin Campbell makes Jackie Chan serious in The Foreigner". Monsters & Critics. 9 October 2017. Retrieved 12 October 2017. ↑ "Director Jim Sheridan's Next: 'H-Block' Coming Together With Cillian Murphy, Jamie Dornan, Pierce Brosnan". Deadline Hollywood. 1 May 2017. ↑ "Jim Sheridan's Prison Break Movie 'H Block' Being Postponed". Deadline Hollywood. 7 August 2017. Retrieved 23 November 2017. ↑ "Pierce Brosnan, Jesse Eisenberg And Vanessa Redgrave On For The Medusa". 11 May 2017. Retrieved 7 January 2018. ↑ "Former SEGA CEO Bernie Stolar teams up with 3D Realms on new project". 7 July 2017. Retrieved 23 November 2017. ↑ "Berlin: Pierce Brosnan to Star in Heist Film 'The Misfits' (Exclusive)". February 12, 2019. ↑ "Pierce Brosnan shares a glimpse of 'The Misfits' set in Abu Dhabi". February 24, 2019. ↑ "Metro.co.uk". Retrieved 19 February 2007. ↑ Lang, Kirsty (3 December 1995). "Bond drops a bomb". The Sunday Times. ↑ Silverman, Stephen M. (11 April 2007). "Halle Berry, Others Protest Natural Gas Facility". People. Time Inc. Retrieved 17 April 2007. ↑ "London Live Earth line-up revealed". NME News. 5 July 2007. Retrieved 8 January 2008. ↑ "Sea Shepherd Advisors – Pierce Brosnan". Archived from the original on 3 March 2016. ↑ "Sustainable Style Foundation". Archived from the original on 3 September 2010. Retrieved 27 August 2010. ↑ "The Official Website of Pierce Brosnan". ↑ "Pierce Brosnan to promote Lee breast cancer fund raiser". The Business Journal. American City Business Journals. 10 July 2006. Retrieved 22 February 2007. ↑ Lipworth, Elaine (17 February 2006). "Pierce Brosnan: A new licence to thrill". The Independent. London. Retrieved 19 February 2007. ↑ "Cassandra Harris, Actress, 39". The New York Times. 31 December 1991. Retrieved 19 February 2007. ↑ "Bond star Brosnan made honorary OBE". BBC NEWS. 14 July 2003. ↑ "Pierce Brosnan and Eddie Jordan awarded Honorary Doctorates from Dublin Institute of Technology". Dublin Institute of Technology. 23 June 2003. Archived from the original on 1 February 2014. ↑ "Honorary Conferring Ceremony– 4 June 2004" (Press release). University College Cork. 28 May 2004. ↑ Nathan, Ian. "Public Access: Pierce Brosnan". Empire (135): 10. ↑ Rocha, Veronica; Parker, Ryan (February 12, 2015). "Fire at Pierce Brosnan's Malibu home causes $1 million in damage". Los Angeles Times. ↑ Doell, Zach (August 28, 2015). "Pierce Brosnan Reveals He Lost his Aston Martin in a House Fire". Yahoo! News. ↑ "Trailer and Poster for Survivor, Starring Pierce Brosnan and Milla Jovovich". ComingSoon. 2 April 2015. Retrieved 2 April 2015.